This article deals with the legal framework for the use of drones in Tunisia. It is incredibly time-consuming to get a drone permit in Tunisia. So far, according to media reports, only an insufficient number of permits issued. If you want to bring a drone from overseas to Tunisia, you will have to fulfill additional requirements. The current law dates back to 1995, and it does not look like there will be any simplification shortly. Meanwhile, many Tunisia travelers had to gain bad experience already. 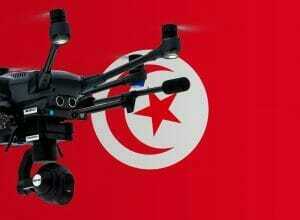 If you travel to Tunisia with a drone without permission, you have to expect that your aircraft will be confiscated. You may also have to undergo an interrogation. In some cases, vacationers have been temporarily arrested. After your copter has been confiscated at the airport, your drone will probably be stored until your departure. Supposedly you will get back the copter on your departure. We have researched the listed drone regulations for Tunisia to the best of our knowledge. We cannot guarantee the correctness of the information. If you want to be on the safe side, contact the competent aviation authority. Alternatively, you can also ask the embassy in your country for further information about the regulations. Please leave us a comment when you receive news and/or gain experience with your copter in Tunisia! We are with a sailboat in Tunesia, and the police is indeed quite nervous about drones. In this country drones aren’t toys, like in Europe. We knew this before, so we told them we owned a drone and after a few hours check if we did not film anything yet, they kept the drone and we where pointed to Tunis. So after a 3 hour travel we arrived in Tunis at ministry of Interior, they could not help us and pointed us to ministry of defence. They could not help us either, so we were pointed to ministry of Equipment. They have a department for ports and aviation, and that is the place where you should apply for an authorisation to fly the drone in Tunesia. They where very helpful and asked us to put up a document with the reason why we want to film, all the exact locations (with maps) the height, the pilot who is flying it and the date and time you want to use it. We have to deliver this in 4fold so they will forward our request to the ministry of interior, defence and 1 more. You can only do this by physically visiting this office and it takes about a month to have the authorisation ready to be picked up. The maximum time this document is valid is 1 month. When you want to use your drone for a longer period in the country you can visit this office again for another month. (this process can be repeated until you are done). It took us 2 days so far, and we still have to put up the documents, wait, and pick it up again. Hopefully this helps you so you know straight away where to go and what to do. Oh wow, that’s a lot of work to accomplish to operate a drone. Thank you very much for your insights! Yep! We filled out the documents now, and are waiting for the response. You need to prove that you have a ‘drone license’ and insurance for it as well. i would love to know more information about getting a drone permit in Tunisia. We made a vlog about it. I think it makes it very clear when you watch this. When you have more questions you can ask them here.